Picture a typical hair salon: rows of chairs lined up with big mirrors positioned on the wall in front of each. You’ve seen one, you’ve seen them all. But imagine if those mirrors weren’t there and instead, you settled into your chair and let your hairstylist do her thing while you waited blindly to see the finished product. Are we giving you anxiety yet? Trusting someone with a pair of scissors anywhere near your head is a big feat. But a new salon in New York City, O&M.nyc, the first U.S. salon by Australian-based Original & Mineral, takes that notion of trust to a new level by removing the mirrors from the equation. Instead, clients sit around a custom-built wooden table where they can converse with others or watch a black and white movie projected on the wall. Janelle Chaplin, creative director for Original & Mineral, says that going mirrorless is meant to create a more relaxed feeling for clients. “It’s a more personal experience and not as awkward as talking to someone through a mirror,” Chaplin says. “There are less boundaries for conversation about your styles,” she notes, which allows the stylist to better match the exact cut and color that clients are asking for. But are most women really willing to fully trust a hairstylist with such an important part of their appearance? Vivian Diller, Ph.D., clinical psychologist in NYC and author of “Face It: What Women Really Feel As Their Looks Change,” is a little skeptical, considering how important hair is to most women. Our attachment to our hair, Diller says, "goes back hundreds and thousands of years to an association with being an attractive, fertile woman.” Now, our roles are more numerous than just attracting a mate, she says, but having hair that we feel in control of is still an important part of our female identity. Unlike other aspects of our appearance, we can easily change our hair and choose how we want it to be cut, what color we want it to be. Relinquishing that control to a stylist takes serious trust. Although it could be scary, she does note that giving up control can also be refreshing and eye opening. “The liberating, relaxing feeling that you’re handing something over that matters to you to someone else, that’s a wonderful feeling,” she says. “And it may be a good experiment to recognize how dependent you are on a mirror.” But realistically, she doesn’t see most women being brave enough to give up that control. So far, according to Chaplin, reactions from salon-goers have been very positive. “We have hand mirrors available; however, most have loved not looking at themselves during the process.” "It is wonderful for networking," she adds, but "the table is large enough that you still have privacy if you want. 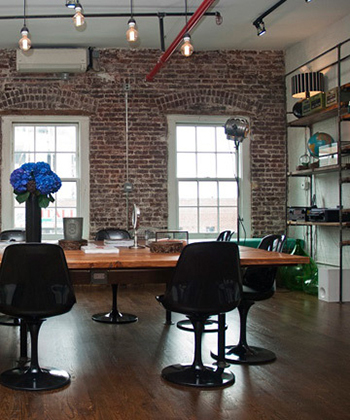 It is like having your hair done in a chic loft. The very modern concept empowers women, as they do not have look at themselves for two hours during the process."